The fourth issue for 2018 has now been published and contains papers on the 4G to 5G network architecture evolution, what now for the Australia's NBN, privacy and security, the impressions of an overseas visit by a lines engineer, flow-level load balancing of HTTP traffic using OpenFlow, and conflicts in routing and UAV Autonomy. The third issue for 2018 has now been published and contains papers on fixed broadband adoption and economic growth in ASEAN, a frameworkfor demystifying M2M spectrum regulation, bitmaps and bitmasks, efficiently compressing deterministic automata and the communications for the America's Cup Challenge defence held in Fremantle, Australia. The first issue for 2017 has now been published and contains papers on International telecommunications legislation and regulation, innovative research, public policy and the history of Australian telecommunications. 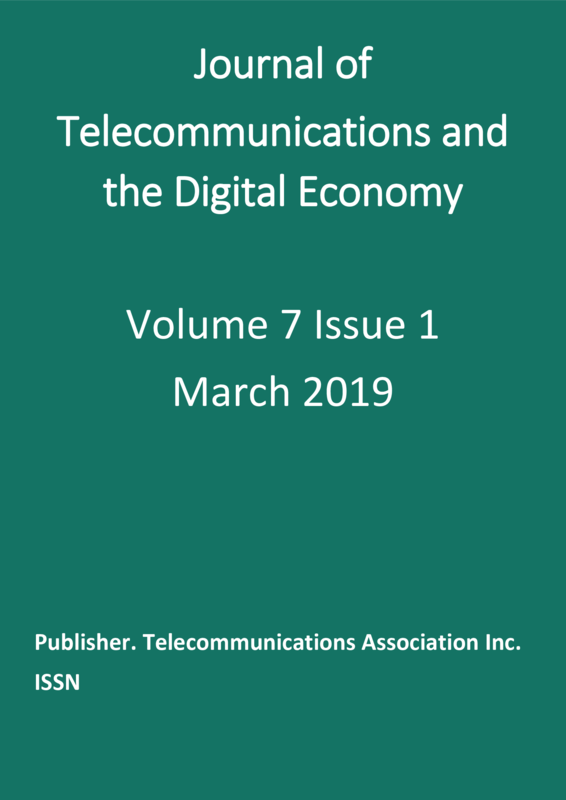 The first issue of the Journal of Telecommunications and the Digital Economy for 2019. All papers are peer reviewed and a similarity score search is used to ensure the papers are suitable for publication. Papers are now published continuously.